Sometimes to functioning security settings properly, it is vitally required to set up workstation's or domain's password policy. For example, if you want to deny domain users to log on to a system without supplying strong passwords, you should restrict it through the domain password policy. However, that would be quite a problem if you cannot log on to the workstation or to the domain as an administrator. 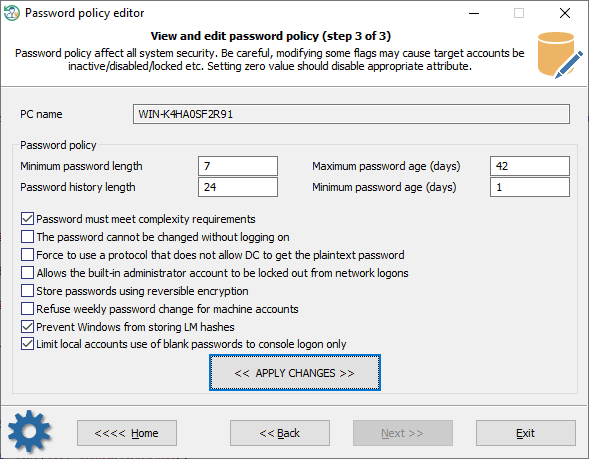 The new RWP's password policy editor can get around the problem and allows changing various password policy's properties on any Windows system offline, without logging on to the system. 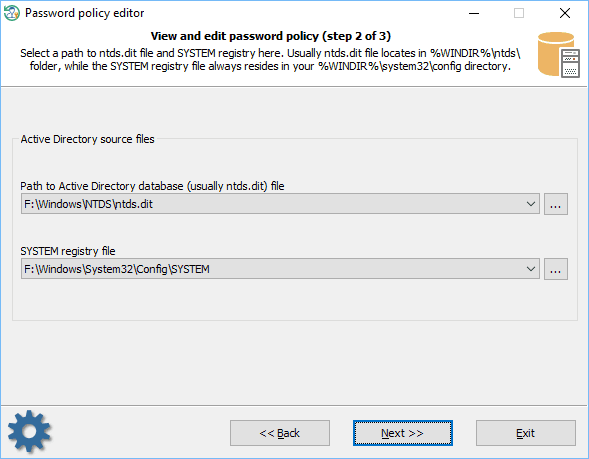 - or NTDS.DIT and SYSTEM, when you need to change the password policy properties of a domain. The program should try to find the files automatically. You can, however, provide the paths manually. Minimum password length - minimum length of a valid password, in characters. Password history length - the number of previous passwords saved in the history list. A user is not allowed to reuse a password from the list. Maximum password age - maximum length (in days) that a password can remain the same. Passwords older than this must be changed. Minimum password age - minimum length of time before a password can be changed. Password must meet complexity requirements - passwords must meet the following minimum requirements: contain no user's account name or a part of it, be at least six characters in length (if otherwise is not set), contain characters from at least three charsets, do not be one used previously (if password history is set). The password cannot be changed without logging on - password cannot be changed without logging on. Otherwise, if it has expired, you can change it and then log on. Force to use a protocol that does not allow DC to get the plaintext password - forces the client to use a protocol that does not allow the domain controller to get plaintext passwords. Allows the built-in administrator account to be locked out from network logons. Store passwords using reversible encryption - force to store plaintext passwords for all users instead of hashing the passwords. Refuse weekly password change for machine accounts - removes the requirement for any machine account to automatically change its password every week. To disable an editable attribute, just set zero value into its edit box. Be careful, altering any value of the password policy will affect all security of the Windows system!